Every year, Dubai welcomes hundreds of South Asian tourists and visitors, besides hundreds of those who reside in the city. Dubai widely held the visitors, residents and tourists from South Asian countries such as Indian and Pakistan, and the community has fortunately become one of the significant parts of the conurbation. The marketplace, food industry and brands has also specifies their produce to cater the needs of the South Asian populace. South Asian food specifically from Pakistan, India, Iran and Afghanistan is very famous across the world. If you are a South Asian visitor or resident or may be from the west, but always wish to eat South Asian food, then your dribbling taste buds can be lusciously treated by the profligate and luscious menus at the Indian buffet restaurants in Dubai. If you’re interested in any sort of buffet restaurants, then you should check out best priced quality buffet restaurants in Dubai article. Dubai has an inclusive array of Indian buffet restaurants which offers great Indian food menus. Here you can find the best flavors of the Indian cuisines prepared from high quality ingredients offered at a very fair price. Although Dubai has a reputation of being excessively pricy, especially in regard of feasting; however the Indian and Pakistani restaurant are the cheapest among all. You may find diverse eating options that will be idyllic for price, quality and ambiance. Here revealed are the best five Indian buffet restaurants in Dubai, that offers you the best variety of Indian curries, rice, barbecue, and deserts options. Lal Qila is by far one of the best place for buffet lovers with traditional buffet settings and ornamental interiors. Lal Qila offers the best Indian food in town with royal dining ambiance. Here you can unquestionably find the authentic flavors of Indian spices that your taste buds ever dribble for. Lal Qila should be on the top of your list when it comes to the luscious extravagant Indian buffet. You may find here all the customary dishes such as Indian curries, Biryani, Rajma, Palak Paneer, barbecue items and much more. Lal Qila offers you an ultimate food pleasure with its majestic and royal ambiance. The average cost for two at Lal Qila is AED 150. Lal Qila is located on Jumeirah 1, besides ENOC fuel station, Union Flag Area on Al Wasl Road – Dubai. When it comes to Indian buffet restaurants in Dubai, Lal Qila should be your first choice. AB’s Absolute Barbecues is another pronounced place to find Indian lunch and dinner buffet at the affordable price in Dubai. It is a great place to enjoy deliciously palatable Indian cuisines with your family and friends. The Indian buffet restaurant is usually packed throughout the day with both tourists and visitors therefore prior reservation booking is recommended. AB’s Absolute Barbecues offer a marvelous choice of Indian food selection. The ambiance is designed for casual dining. You may find a great variety of luscious Indian deserts here as well, including Kheer, Rasgula, Gulab Jamun and variety of Halwa. The salad sections is also lip-smacking and offers a great variety of world famous Indian pickles. The average cost for two here is approximately AED 140. AB’s Absolute Barbecues is located in Dubai Media City, Sheikh Zayed Road – Dubai. For all those who are dense eaters, Nayaab Handi will be the best place to enjoy a hefty Indian menu with great deserts and combinations. At Nayaab Handi you may find the delectable variety of Continental seafood recipes. Their Indian vegetable curry, Chicken Handi, Lamb Chops, Kebabs, Biryani and Pulav are the premium food glees. The Nayaab Handi is situated on the ground floor of Al Ghazal Mall, Satwa – Dubai. The place offers a great buffet selection for breakfast, lunch and dinner at a reasonable price. The average cost for two at Nayaab Handi is AED 110. Barbecue Delights is greatly endorsed if you are looking for a sterling dining experience. The mouthwatering assortment of dishes here is outlandish. The restaurant has a marvelous variety of delectable customary Indian food and rich desserts. The ambiance of the place offers stunning skyline views that make this restaurant a perfect spot to rejoice with your loved ones. It is a must-try Indian buffet restaurant in Dubai and highly recommended for those who are interested to indulge their appetite for authentic South Asian cuisine. Barbecue Delights is located adjacent to Sofitel Hotel, Lamcy Square, near Movenpick Hotel Oud Metha Road – Downtown Dubai. Bar.B.Q Tonight is an assured hot favorite among lovers of South Asian particularly Indian, Mughlai and Pakistani cuisine. Bar B.Q Tonight excels in serving traditional and authentically flavored Bar B.Q and other Indian and Pakistani food items. Their lamb chops, steaks, grills, curries and grilled fish are the tastiest among all. Average meal for two costs around AED 120. It is located at H.H. Hamdan Award Complex, Jumeirah Beach Road, Opposite Union Flag, Dubai, UAE. Prior reservations are recommended. 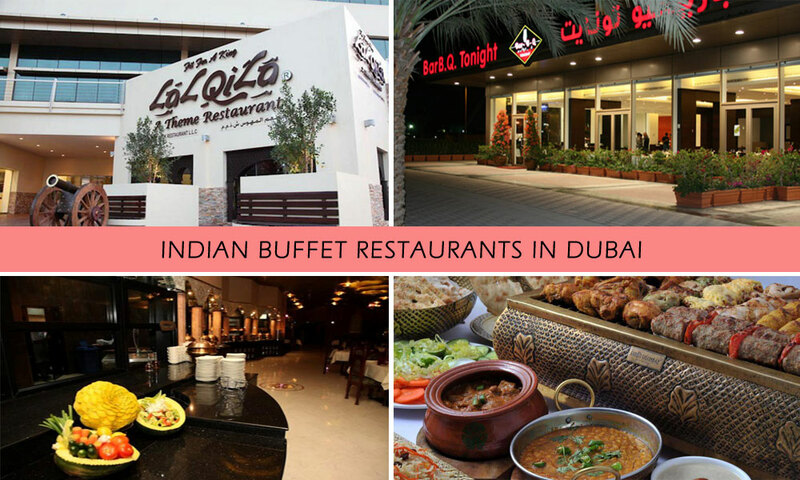 These are some of the quality Indian buffet restaurants in Dubai, which are highly recommended. If you’re interested in seafood, then you should checkout places to try a seafood buffet in Dubai. To recommend a quality Indian buffet restaurant, please add comments below.